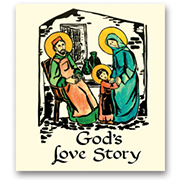 Introduce your child to God's inspiring love story, as written and illustrated by Poor Clare Nuns. The sisters bring young readers from Creation through Pentecost, revealing the wonder and marvel of God's love for each one of us. A beautiful story for children enriched by a wealth of gentle illustrations. This title is a core text in CHC Lesson Plans for Preschool and provides a gentle introduction to Salvation History and its meaning for each of God's children. Softcover. 67 pages. 8"x9"